The beginning of the 1960s saw the first 45s in Congo. And soon after -as in the rest of the world- the EP. The Ngoma label, founded in 1948 by Nico Jeronimidis and led by N. Cavvadias, went with the times and introduced the series Ngoma Super 45 t.
The releases were a mix of re-releases and new recordings. I'll post some more later but here are two of my favorite Super 45's. 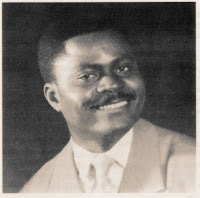 Both feature the great Mwanga Paul, who had switched to the Ngoma label after the demise in 1956 of the Opika label (see this earlier post). Accompanying Mwanga are on Super 45 No.30 his own Affeinta Jazz and on No.66 Jazz Venus. I especially like the Kikongo tracks like the two last tracks on the B-sides. this is blog is pretty darn super itself. Thanks for providing such an amazing service to lovers of old skratchy virtual vinyl such as myself. wonderful to hear more stuff from ngoma--so little is available commercially.